﻿ What are the benefits of bulletproof backpacks? Nowadays，a series of shooting incidents have rose in America, bring innocent civilians a lot of pain and panic. This also remind us that we need to find effective measures to protect the safety of ourselves and our families. Many of those shooting incidents happened in campus. As students are a vulnerable group with little self-defense ability, many parents have turned to protective equipment for help. There are many kinds of protective products, such as bulletproof vests, hard armor plates, ballistic shields and bulletproof backpacks. bulletproof vests, hard armor plates, ballistic shields are all heavy in weight, unsuitable for daily use, while bulletproof backpacks are relatively lighter in weight, and smaller in size, which can be regarded as a good choice for students and businessmen. Then what are the advantages of bulletproof backpacks? Now let's introduce it in detail. The first and obvious function of the bulletproof backpack is to protect wearers from the attack of bullets. They are generally NIJ IIIA, with a capability of stopping 9mm and .44 as well as other powerful bullets. The bulletproof backpack is made by combining a bulletproof insert with a backpack tightly, which can provide a better protection for the back of the body. In addition, when necessary, it can be used as a hand-hold shield helping the users to break through the encirclement and reach a safe area. The backpack can also withstand several gunshots and still keep your tablets, laptops as well as other valuables safe and secure from harm. Compared with other bulletproof products, the biggest feature of bulletproof backpack is mobility. Bulletproof backpacks, just like ordinary backpacks, have no restrictions on the user's movement, and they can be regarded as the most convenient and comfortable equipment among these protective products. So, it is undoubtedly the best choice for students and business people who travel frequently. bullet-proof backpacks are designed into a variety of styles to meet the needs of different users, which is different from ballistic vest, and hard armor plates, etc., which are limited in style. You can choose different colors, patterns, shapes and capacities of backpacks according to your preference. Just as ordinary schoolbags, bulletproof backpacks can also have some special functions, which bring some convenience for users. For example, some backpacks are equipped with earphone holes that make it safer to listen to music without having to put a cell phone or music device in a pocket or in hands. 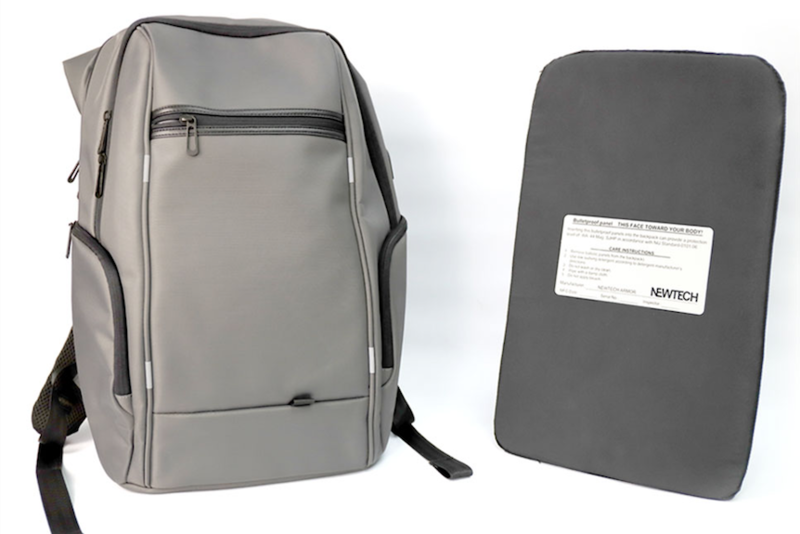 For example, the bulletproof backpack of Newtech armors is equipped with an external USB interface, which makes it easier for us to charge electronic devices, so it has won most of students and business people’s love. Bulletproof backpacks are the cheapest ones of all kinds of bulletproof products. Generally speaking, a body armor costs at least $ 600, while a bulletproof backpack only $ 200 to $ 300. Therefore, for most ordinary consumers, bulletproof backpack is a better choice. There are many authoritative manufacturers of protective equipment, such as America’s Bullet Blocker and Guard Dog, as well as china’s Newtech (Wuxi), which are all equipped with excellent R&D teams, abundant production experiences. Their products are all NIJ qualified, which you can feel free to buy and use.